Since her debut, Nina Stemme has had a dead straight career upwards, conquering the world’s most important opera houses. Strangely though she has not been vouchsafed a corresponding recording career. The few recordings she has made have however had glowing reviews, not least on Musicweb-international. Hubert Culot praised her only previous solo recital with Wagner’s Wesendonck Lieder, Gösta Nystroem’s Sånger vid havet and songs by August de Boeck, Christopher Webber was impressed by her singing in Zemlinsky’s Der König Kandaules, Em Marshall admired her Senta in Chandos The Flying Dutchman, and Marc Bridle made EMI’s much publicized Tristan und Isolde, where she sang against Placido Domingo, a Recording of the Month. Last year I reviewed her twice for Seen and Heard, where especially her Sieglinde in Stockholm’s new Walküre was an achievement to set beside the best ever (also the Twelfth Day concert). Now comes a Strauss disc that certainly lives up to the high expectations. It is cleverly arranged with the three works in chronological order so we can follow the evolution of Strauss’s orchestral palette through a period of 43 years. It ranges from the ostentatious late-romantic eruptions of passion and brutality in Salome via the reduced, more classically-oriented melancholy of Capriccio to the autumnal darkness of the Four Last Songs. With Antonio Pappano drawing at the same time powerful and refined playing from the admirable ROH orchestra and EMI offering a recording that lets us hear all the strands in the orchestration, we are in for a sonic treat. The ominous opening sounds of the Salome piece make one feel in the midst of a tornado. Without being in the least rushed Pappano manages to keep the tension close to the boiling-point through this abominable scene. He is just as apt at keeping the subdued Capriccio finale alive. Having within the last year or so listened to reissues of the possibly two most formidable Salomes, Inge Borkh and Birgit Nilsson, it was quite a revelation to hear Nina Stemme’s leaner, more girlish timbre. She projects a certain vulnerability depicted through the slight flutter in her voice, while there certainly is no lack of force and intensity. She has a mezzo-like roundness of tone, not unlike Flagstad’s, but the upper layer of her tone is all glittering silver where Flagstad’s was frosted bronze. Salome is a monster, as Herod says, but she is also a human being with basic feelings and when she sings Und das Geheimnis der Liebe ist grosser als das Geheimnis des Todes (And the mystery of love is greater than the mystery of death) Stemme also expresses the weakest of emotions in a beautifully inward and deeply probing reading. After the barbaric and horrifying crashing of Salome the beautiful and poetic Moonlight music of Capriccio comes as balm for a wounded soul. The ROH strings create a luminous nocturnal atmosphere and when Countess Madeleine appears it is still Stemme, for sure, but she is now a quite different character: lighter, more lyrical, nobler, more dignified. She is also slightly vulnerable through her ambivalence: Willst du zwischen zwei Feuern verbrennen? (Do you want to be consumed between two fires?). That slight flutter again reveals this – as was the case with the two foremost Countesses from the past: the Elisabeths Schwarzkopf and Söderström. Stemme, though possessor of a larger voice than either of them, is still able to pare it down to the requirements of the part and is on a par with her great predecessors. She has recently taken on Arabella and judging from this Countess she should be great in that part too, as she was as Feldmarschallin in Gothenburg a couple of years ago. Turning then to Vier letzte Lieder I was very much looking forward to this recording since I heard her in these songs relatively early in her career at a concert in the Berwald Hall in Stockholm with Roberto Abbado conducting. This was in March 1996. Details of interpretation tend to slip out of one’s memory but I seem to remember a fresh lyrical approach that was very appealing. Her reading here is still very appealing but it has changed, mainly through her voice having grown and adopted that mezzo-roundness I referred to earlier. Considering that it was Flagstad, the Isolde of her time, who first sang these songs in 1950, it seems quite appropriate that the Isolde of our time also should sing them. Tradition has made them lyric soprano repertoire and certainly they are mainly inward and soft but there are passages where a more powerful voice can make its mark, as for instance in Frühling. Stemme sings the opening In dämmigen Grüften with the darkness of tone and bite that possibly only Jessye Norman has challenged on disc. The same goes for September, where she more readily creates an autumnal feeling. Twilight sets in gradually during the course of the songs, the vocal line becomes more inward, only the opening strings of Im Abendrot still glow, but this represents only the last rays of sun: … es dunkelt schon die Luft (already the air grows dark). Two larks still soar in the sky, but for us it is time to sleep – is this perchance death? These are touching words to read only, enhanced by the music and performed by a decent singer they can provoke deep thoughts; as sung by Nina Stemme they go directly to the heart. The orchestra play just as wonderfully here, there are fine instrumental solos by hornist Richard Clews and violinist Peter Manning. Tempos are fairly measured but not long-winded. 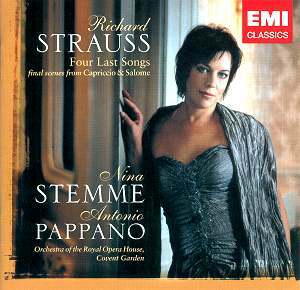 I have compared ten recordings of the songs and Stemme and Pappano occupy the middle ground. In general timings differ within a few seconds within the songs. The greatest spread can be found in the last song Im Abendrot, where the extremes are Lisa Della Casa (5:59) and Lucia Popp, who is constantly the slowest, (8:23). Stemme at 7:35 steers a middle course. Of course it is well nigh impossible to give a clear recommendation, considering how many first-class versions there are. Schwarzkopf and Della Casa will always be on my short-list. I do like Studer, Lott and Te Kanawa, and Soile Isokoski’s quite recent recording should not be missed. Nina Stemme belongs in this select company. With the extra dramatic over-drive she can switch on when needed and her superb portraits of Salome and Madeleine as bonuses this is a disc that should find a place in every Strauss lover’s collection. Let me only add that besides informative liner notes by Michael Tanner we get the full texts with translations in French and English.